As a basic component of soil, sand and rock, Silica is one of the most widespread minerals on earth. It’s most commonly found in quartz, which in turn is used in products like concrete, brick, ceramic tiles, dental filings, jewelry, tombstones and more. Though it exists in many forms, it becomes crystalline and airborne when exposed to high heat or intense pressure like abrasive cutting, crushing and sawing. That’s when you need to beware. When Crystalline Silica particles are inhaled, they make their way deep into your lungs which, in turn, begin to develop scar tissue nodules around the particles. Though it can take years for full symptoms to appear, Silica exposure has been directly linked to lung cancer, kidney disease and chronic obstructive pulmonary diseases. One of the highest risks for workers repeatedly exposed to Silica is Silicosis, a nonreversible lung disease with symptoms that can range from shortness of breath and chest pains, to an eventual inability to breathe that could turn fatal. For people with a smoking habit or existing lung conditions such as asthma, exposure to Silica can seriously compound debilitating lung and breathing problems. Crystalline Silica is more likely to be present in the air when you’re cutting, sawing, drilling or crushing concrete, brick, ceramic tiles, rocks or stones. It also shows up whenever you’re working with sand products like glass and pottery. Some of the more dangerous workplaces include mines and foundries and tasks that include abrasive blasting. Provincial and federal authorities have established occupational exposure limits and guidelines to help manage the risks posed by airborne Silica, but research has shown that long-term contact with even small quantities of the mineral may have a serious impact on your breathing and overall health over time. So if you’re unsure of the different products and processes being used around your site, we recommend wearing protective gear to reduce the potential risk. Approximately 900,000 Canadians are occupationally exposed to Silica on a regular basis. Amongst the most at risk are construction workers, heavy equipment 0perators and plasterers or drywallers. There are a few different ways of keeping dust levels down on your construction site, which in turn will keep Silica particles from becoming airborne. Many workers will opt for methods like wet cutting, vacuum dust collection systems, intense ventilation or hosing down work sites to keep Silica dust from forming. Ask your employer about the different measures available to your team to reduce exposure risks. As every province has different rules and regulations around managing Silica exposure, it’s important to stay up to date with legal limits, testing methods and the latest data on how you can minimize risk. 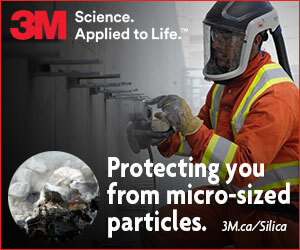 Once you have a sense of your exposure level, you’ll want to take a look at 3M’s full range of respiratory protection products to find the right product for your risk level. Whether it be a lightweight disposable respirator, a half-face respirator, full-face protection or a heavy duty powered headtop; all of our products use advanced electrostatic media technology to let you breathe comfortably while keeping dangerous dust and particles out of your lungs. At any time, you can get in touch with one of our respiratory experts for personalized guidance on the kind of protection you need. Their job is to evaluate risk, put your mind at ease and help keep your lungs safe so you can focus on what matters: doing your job properly and staying healthy for your loved ones and family.